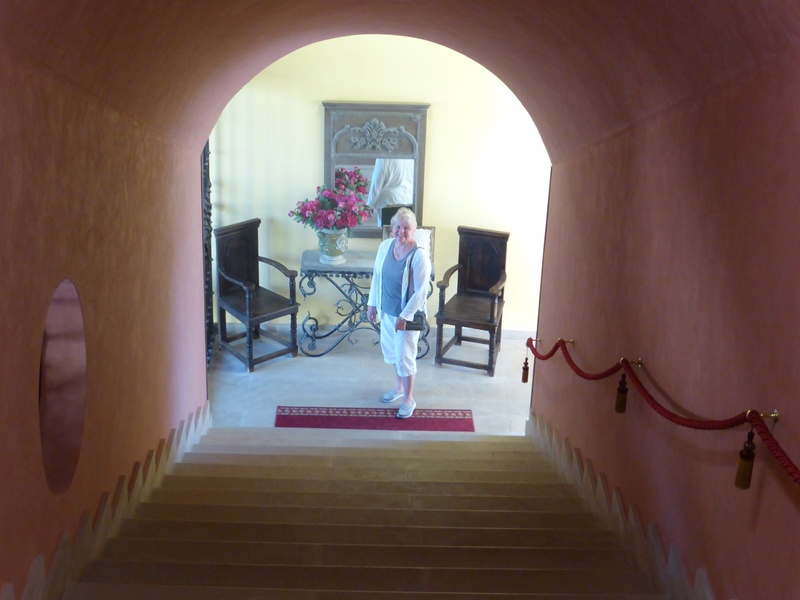 The stairs leading to the Queen’s Room… where we are at the top of the stairs. This is a huge old beautiful hotel in the middle of no where. Good choice Mutti! And finally – the Queen’s Room…. three times the size of the one last night. And yes – a tub! We were on our own for most of today’s walk. The other peregrinos were travelling further and had started long before us and at a faster pace. One Japanese fellow was left with us as we were having breakfast. He spoke English well but no Spanish and he was trying to ask the inn keeper’ s wife if they would take his suitcase to the bus stop. Yesterday, Mutti had said about five words in Spanish to the owners, so (in desperation, we suppose) the woman turns to Mutti and starts asking her in very rapid Spanish what the man was saying. It was a mini sitcom. For some reason Mutti knew the Spanish words for luggage and bus:-) Alfredo, the inn keeper got his car keys and we hope our fellow pilgrim and his suitcase got to the bus stop. The landscape today was more fields of stubble and sunflowers. 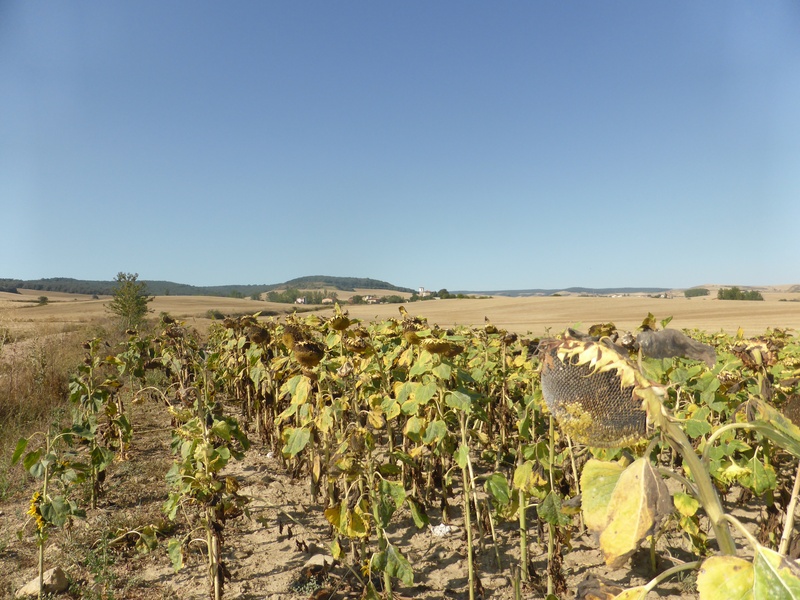 The sunflowers are past their prime and sorrowful looking with their heads bowed. 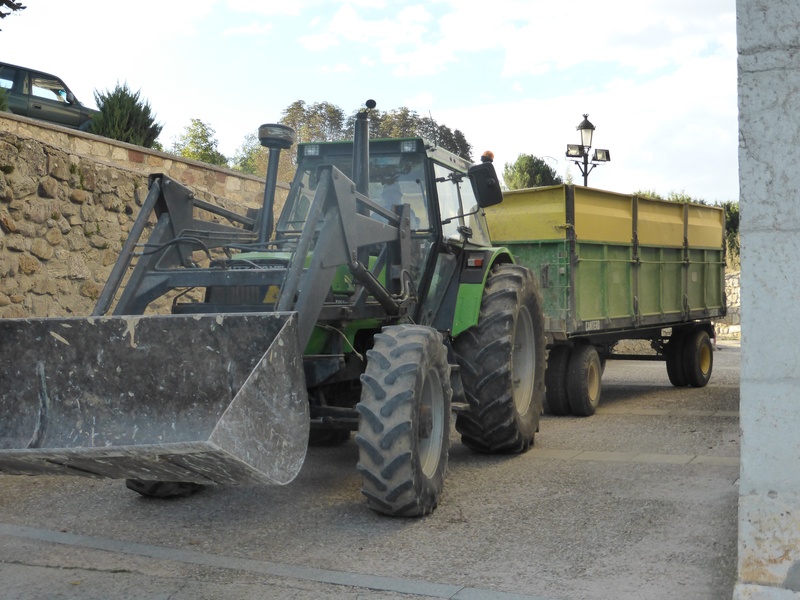 Although we thought we were going to be on the flat meseta for the past several days, we have discovered it really begins right about where we will end this year’s walk. The climbs are gentler now but often still long. It sometimes feels like we are going up forever. We realize suddenly we have only a week left of our Camino until next year—5 days to walk and 2 rest days!! These days have passed so quickly. Only writing this blog had kept us aware of the date. It has been easy to lose ourselves in the tempo of our footsteps, the solitude, and just being very present in our world. One pilgrim wrote that she began the Camino “from a life at the speed of light and completed it at the speed of life”. Walking long distances does cause you to slow down in all ways. It is very nice. 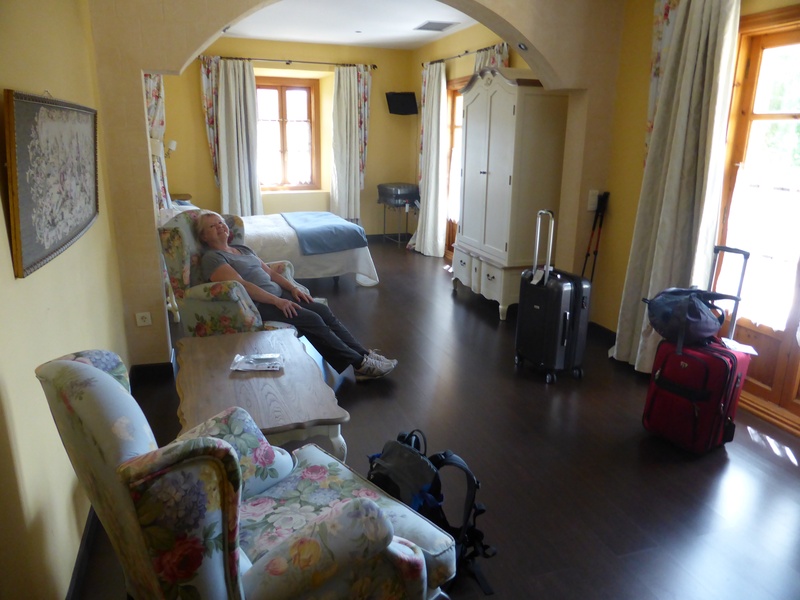 Dad has had fun trying to determine the demographics of Camino pilgrims….at this time of year his breakdown is 10% over 60, 50% between 40-60 and 40% under 40. The under 40 increases when school is out and families hike together. We have not met anyone else over 70 yet. we (Mutti) had a George Clooney sighting in our hotel restaurant. She actually managed a surreptitious photo as evidence. It turns out George is in Venice.